Dr. Ahmed’s research interests include linear and non-linear optimization techniques, low complexity parameter estimation for communication and radar systems, passive radar, and waveforms design for MIMO radar. He is a senior member of IEEE and a recipient of contribution award from the University of Edinburgh for his exceptional research on waveform design for MIMO radar on a Defense Science and Technology Laboratory, Ministry of Defense UK Project. 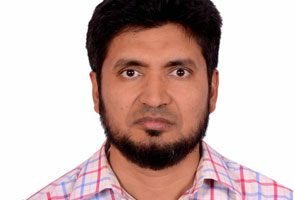 Dr. Sajid Ahmed (M’08, SM’12) did his B.S in Electronics Engineering from Sir Syed University of Engineering and Technology Karachi, Pakistan in 1998 and M. Sc in Communication Engineering from University of Manchester, Institute of Science and Technology, UK in 2002. He completed his PhD in Digital Signal Processing at the King’s College London and Cardiff University, UK in 2005. He was a researcher at the Queen’s University Belfast, UK and the University of Edinburgh, UK. From January 2012 to June 2017, he worked in the King Abdullah University of Science and Technology (KAUST), Thuwal, Kingdom of Saudi Arabia as a Research Scientist. Accepted subject to revision in IEEE Transaction on Signal Processing, Mar. 2017. S. Jardak, S. Ahmed, and M. S. Alouini, “Generalized Two Target Localization Using Passive Monopulse Radar,” IET Radar, Sonar & Navigation, May 2017. T. Bouchoucha, S. Ahmed and M. S. Alouini, “DFT-based closed-form covariance matrix and direct waveforms design for MIMO radar to achieve desired beampatterns,” IEEE Transaction on Signal Processing, vol. 65, no. 8, pp. 2104–2113, Apr. 2017. H. Ali, S. Ahmed, T. Y. Al-Naffouri, and M. S. Alouini, “Target parameter estimation for spatial and temporal formulations in MIMO radars using compressive sensing,” EURASIP Journal on Advances in Signal Processing, pp. 1-11, Jan. 2017.